Larger than expected price declines in the fourth quarter of 2010 has led JPMorgan Chase to downgrade its expectations that housing prices will improve. 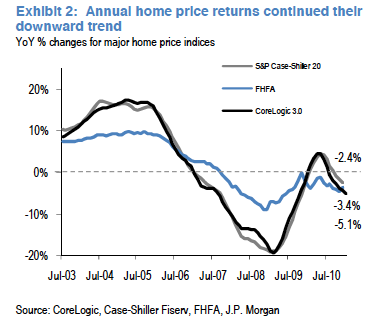 The revision indicates that after housing gains in the first half of last year, the market may now double dip. According to analysts at Chase, their base home price forecast now shows at peak-to-trough a 34 percent decline for the Standard & Poor’s/Case-Shiller national index. This marks an additional 3 to 4 percent drop from the fourth quarter which they estimate will extend the downward trend in pricing through the spring. “This is the first downgrade to our forecasts in the past 10 months, driven by bigger-than-expected price declines in recent months and increasing uncertainty around the supply-demand imbalance,” said analysts from the JPMorgan U.S. Fixed Income Strategy division. Chase said they do expect to see moderate improvement in the summer leaving overall prices for 2011 down by 2 to 3 percent. However, Chase analysts also said that due to possible changes to the National Association of Realtors (NAR) home sales data that may have overstated actual home sales, the bank will adjust their forecasts accordingly. According to the latest data from the Clear Capital’s Home Data Index (HDI), home prices dropped for the sixth consecutive month in February, largely due to price drops in the western United States.